INDIANAPOLIS -- It was one of those moments where the father stepped to the forefront, raised his voice and Paul George knew he had to listen. George, isolated on the wing, drove toward the baseline only to have the ball stripped away by Oklahoma City's Kevin Durant. George got the ball back and was ready to go at Durant again when David West yelled, "Paul, easy!" with plenty of bass in his voice. Ron Hoskins/NBAE via Getty Images Paul George listened to sound advice, finding it wise to not always challenge OKC straight on. This wasn't the time to be trying to one up Durant. The picture was much bigger for the Indiana Pacers. The top seed, something that didn't seem imaginable at times over the past few weeks, was sitting there for the Pacers. Getting ahead of themselves is exactly why the Pacers didn't lock up the No. 1 seed in the Eastern Conference weeks ago. George pulled the ball back out, swung it to West, who made a 17-foot jumper. The Pacers didn't always do those things Sunday afternoon against the Thunder, but they did just enough to move their magic number to clinching home-court advantage throughout the East playoffs to one game with a 102-97 victory. A Heat loss in either of their final two games or a Pacers victory at Orlando on Wednesday will give Indiana the No. 1 seed. Hard to imagine that after the way the Pacers have played over the past month, huh? "We're just trying to put together good basketball at this point and hopefully carry momentum into the playoffs, being positive and upbeat about where we are," West said. Coach Frank Vogel brought it to his team's attention days before their March 31 game against the San Antonio Spurs. Center Roy Hibbert looked around, noticing how teams like the Heat, Thunder and Spurs went about their business. It didn't take long for him to realize the Pacers didn't have that same professional approach. "Most of us have never been in that position before," West said. "Since I've gotten here and most of the guys, with the exception of Evan [Turner], everybody is sort of under-drafted, not drafted or simply passed over. Everybody's attitude has been with the underdog mind-frame. "Then you get out front, nobody doubts you because you have a five-game lead and everybody is pumping you up. I don't think we handled that the best. Only way you can deal with it is to go through it and experience it. That's what we've done." 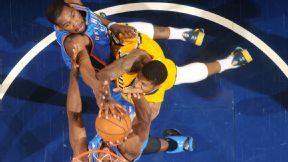 West, the backbone of the Pacers' locker room, made the defensive play of the game when he sniffed out Oklahoma City's inbounds play, left his man and blocked Durant's 3-pointer to maintain their three-point lead with 57.8 seconds left. "[The Thunder] run that play, called elevator action, two bigs try to squeeze the shooter and [West] is one of the best at switching out at [this] in the game," Vogel said. "Switched out and made a big block." Lance Stephenson grabbed the loose ball after West's block and had a chance to drive to the basket, but West held up his hand, similar to the way he did to George in the third quarter, to tell Stephenson to hold up. Vogel called a 20-second timeout to set up a play. Stephenson, defended by Durant on the wing, hit a 3-pointer to put the Pacers up six with 34.2 seconds left. Stephenson then turned into an entertainer. He ran back down court, slapped hands with Vogel along the sideline and turned toward the sold-out Bankers Life Fieldhouse crowd to get them excited. Stephenson resorted back to his early-season ways of being the facilitator, scorer and rebounder for the Pacers. He recorded his league-leading fifth triple-double -- 17 points, 11 assists and 10 rebounds -- in 41 minutes. "That was Lance wanting to take over the game," Vogel said. "Nothing to do with me. It worked. Lance is a big part of who we are. We have to make sure he's playing the right way, playing within himself. ... He's a big part of our personality, big part of our edge. A fan favorite with good reason." It would be foolish to say the Pacers have turned the corner because they still turned the ball over 23 times and they're still 9-13 since March 4. But they're also a game away from locking up the top seed in the East playoffs, something they often talked about for the past 10 months. "We should have [stopped talking] from the beginning," George said. "We should want that goal still and be confident about embracing the goal. But it was putting the pressure on us." MVP: DeMarcus Cousins filled up the stat sheet, finishing with 35 points, six assists and 15 rebounds. He did, however, commit six turnovers and surpassed the NBA's technical foul threshold by picking up his 16th tech of the season. Barring a reversal from the league, Cousins will be suspended for the finale against the Suns. X factor: Ray McCallum had started the last 10 games for the Kings, but went back to the bench due to the return of Isaiah Thomas on Sunday. McCallum, however, played with the same confidence and poise. He finished with 11 points and four assists in 30 minutes of action. Defining moment: With two-plus decades of head coaching experience under his belt, Rick Adelman could be calling it a career. With Sunday's game possibly being his final visit ever to Sacramento, the Kings played a special video tribute for their former head coach, who received a rousing ovation during pregame introductions. MVP: LaMarcus Aldridge. While it was truly a team win -- six Blazers scored at least 13 points -- Aldridge gets the nod because of a team-high 26 points and because he hit the go-ahead bucket in overtime. Defining moment: While MVP honors go to the winning team, Steph Curry's 47-point performance was iconic. He continually willed the Warriors, scoring 20 points in the fourth quarter and overtime while playing the entire second half. That was ... a barn burner: In a playoff-type atmosphere with seeding implications, this one was simply marvelous. Both teams fought back from double-digit deficits, traded leads, and made incredible shot after incredible shot. Also, the win clinched the Blazers no lower than the fifth seed. MVP: Mike Conley. The Grizzlies' always-steady point guard had 24 on 12 shots to go along with eight assists. His eight third-quarter points helped trigger Memphis' big run that put this game away for good. Defining moment: With the game tied at 61, the Grizzlies ripped off a 30-8 run that spanned the third and fourth quarters. Memphis found and offensive rhythm and the Lakers went 8 minutes without scoring a point. X factor: Offensive rebounding. The Grizzlies pulled down 16 offensive boards and outrebounded the shorthanded Lakers 52-32 on the night. With Pau Gasol on the bench for possibly his last home game at Staples, Memphis took full advantage inside. MVP: Joakim Noah fell one assist short of tying Lance Stephenson for the most triple-doubles this season and becoming the first center since Vlade Divac with three straight games with 10 or more assists, but he was at his screaming, defiant best tonight: 13 points, 17 rebounds, and 9 dimes. X factor: He still gambles for steals way too much to be considered a defensive stopper, but when Iman Shumpert is hounding ballhandlers and shooting with confidence, he'll look like the best player on the floor, as was the case during a 9-0 Knicks run to close the half. Defining moment: Chicago was a step slow to close on New York's 3-point shooters all night; a fact Tom Thibodeau will be sure to mention, especially considering the 12-2 spurt at the start of the third consisted of three J.R. Smith treys and one more from Raymond Felton. MVP: DeMar DeRozan took over in the fourth quarter after the Pistons rallied in the third. He scored 16 points in the fourth, including a vicious posterization of Kyle Singler, and finished leading all scorers with 30 points. Defining moment: Toronto's lead had been cut down to 99-96 when Kyle Lowry fouled out with 5:58 left. But Greivis Vasquez filled in admirably, and rather than crumble, the Raptors rallied to extend their lead and win. That was ... winning: The Raptors earned their 47th win of the season, which ties their franchise record. With their final two games up against Milwaukee and New York, it seems that they will likely break it. MVP: Lance Stephenson notched his league-leading fifth triple-double of the season and hit the dagger three that might ultimately determine where Game 7 of the Eastern Conference Finals is played. X factor: On a day where George Hill and Roy Hibbert struggled mightily once again, the Indiana bench picked up the slack as Luis Scola, Ian Mahinmi, and C.J. Watson combined to score 41 points on just 21 shots to give the Pacers a lift. Defining moment:: With 57 seconds remaining and the Thunder down three, Kevin Durant rose up for a three to tie it, only to be blocked by David West. On the ensuing possession, Lance Stephenson rose up and drained a trey to get the crowd on its feet, and the Pacers one step closer to the top seed. MVP: If Mason Plumlee doesn't get named to the All-Rookie First Team, there should be an investigation. He was terrific against the Magic (17 points, 11 rebounds) and has been terrific all season long. Defining moment: It was a sloppy performance from the Nets, as exhibited by their 23 turnovers. So how did they win? A 15-0 run in the third quarter helped them build a double-digit lead and cruise to an easy victory. That was ... much needed: It's been a nightmare season for Andrew Nicholson, who has regressed after a promising rookie year, so Magic fans have to be pleased that he had himself a solid game (12 points, 7 rebounds) in Brooklyn. 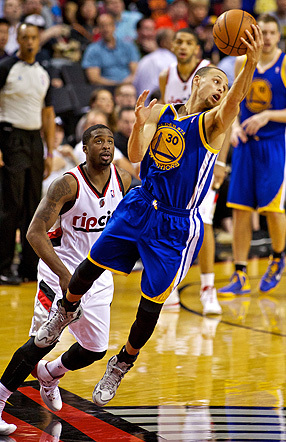 Stephen Curry, Warriors: His season-high 47 points were not enough in a 119-117 overtime loss in Portland. He made 16 of 29 shots, including 7 of 14 3-point attempts. According to ESPN Stats & Info, 26 of his points came on pull-up jump shots. He leads the league with 10.8 points on pull-up jump shots this season, according to the NBA player tracking data. Kevin Martin, Wolves: If the former King wanted to show his old team what they're missing out on, consider this mission not accomplished. He returned after missing five games with foot problems and proceeded to miss all eight shots en route to a goose egg in the Wolves' 106-103 loss to the Kings. "On paper we might be the best team in the league. We've got great players on this team who accomplished so much. We just couldn't put it together." Craig Mitchelldyer/USA TODAY Sports Stephen Curry's season-high 47 points were not enough in Golden State's 119-117 overtime loss in Portland. He made 16 of 29 shots, including 7 of 14 3-point attempts. The Warriors still have two chances to reach 50 wins for the first time since 1993-94. Lance Stephenson had 17 points, 11 assists and 10 rebounds on Sunday for his league-leading fifth triple-double of the season. Stephenson is the first player in Pacers history with 5 triple-doubles in a season.